3 bedroom huge detached Cyprus villa with own pool, double garage, seperate guest house & mature gardens, fruit orchards in 3 donums of land in Lower Lapta, only 600 metres from the beach and 200 metres from the Lapta village centre. The villa sits in 4,200 m2 of private land, ideal development opportunity for the right project that would preserve the nature within it. This idyllic property can be an ideal private setting for a family retreat or perfect investment for villa rental opportunity due to the popularity of charming Lapta area.Mountain and sea views can be enjoyed from this property.Total Living AreasThe Villa 200 m2Double Garage 40 m2Guest House 60 m2Total 300 m2.The main villa has 2 bedrooms and the Guest House is a self contained 1 bedroom Studio. The mature garden has 50 palm trees. Truly classified as a rare find, this villa is offered exclusively via Property Republic. Set in the grounds of 3 donums of land.Main House (Structure) 200 Sq MetresGuest House (Structure) 60 Sq MetresHeated Swimming PoolTennis Court.Artesian Well @ 50 Tons /day capacityMain Generator Jet Gaz 1800 Gas TankPlease contact us to arrange the viewing trip. 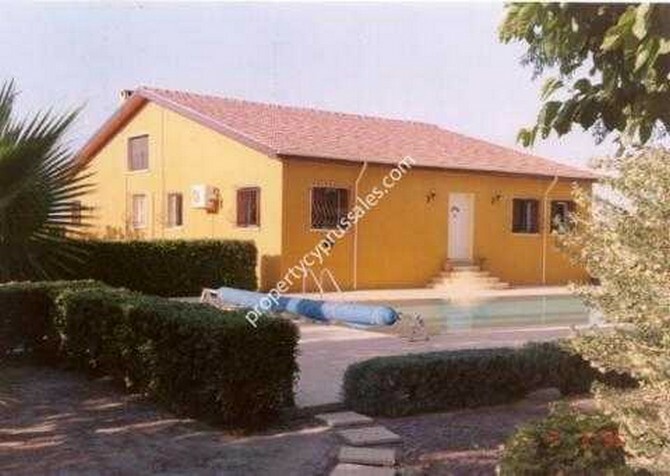 3 bedroom huge detached Cyprus villa with own pool, double garage, seperate guest house & mature gardens, fruit orchards in 3 donums of land in Lower Lapta, only 600 metres from the beach and 200 metres from the Lapta village centre. The villa sits in 4,200 m2 of private land, ideal development opportunity for the right project that would preserve the nature within it. This idyllic property can be an ideal private setting for a family retreat or perfect investment for villa rental opportunity due to the popularity of charming Lapta area. Mountain and sea views can be enjoyed from this property. The main villa has 2 bedrooms and the Guest House is a self contained 1 bedroom Studio. The mature garden has 50 palm trees. Truly classified as a rare find, this villa is offered exclusively via Property Republic. Set in the grounds of 3 donums of land. Please contact us to arrange the viewing trip.